In OpenCV the class VideoCapture handles reading videos and grabbing frames from connected cameras. There is a lot of information you can find about the video file you are playing by using the get(PROPERTY_NAME) method in VideoCapture. One of the common properties you may want to find is the frame rate or frames per second. You can download all code and example images used in this blog here. How to find frame rate of a camera / webcam in OpenCV ? In OpenCV finding the frame rate of a connected camera / webcam is not straight forward. 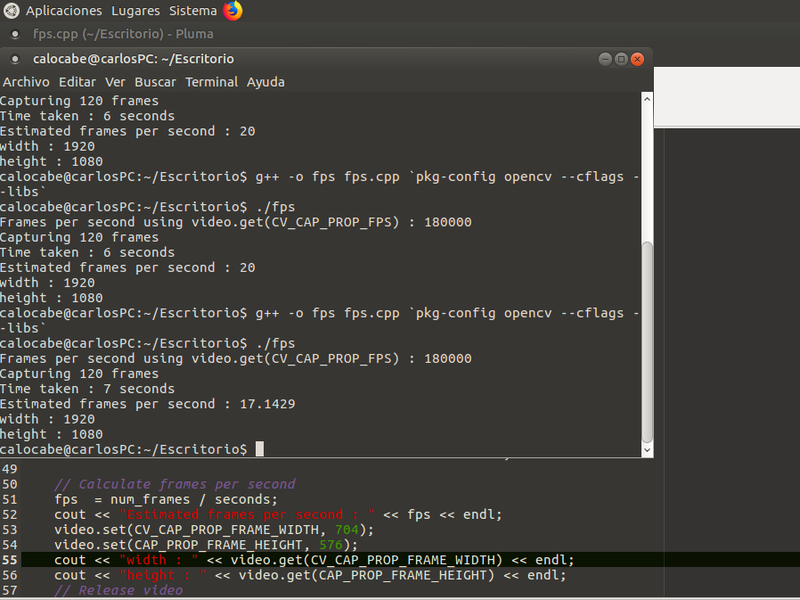 The documentation says that get(CAP_PROP_FPS) or get(CV_CAP_PROP_FPS) gives the frames per second. Now that is true for video files, but not for webcams. For webcams and many other connected cameras, you have to calculate the frames per second manually. You can read a certain number of frames from the video and see how much time has elapsed to calculate frames per second. # With webcam get(CV_CAP_PROP_FPS) does not work. # Let's see for ourselves. // With webcam get(CV_CAP_PROP_FPS) does not work. // Let's see for ourselves. How to find frame rate of a video in OpenCV ? If you are reading a video file you can simply use the get method to obtain frames per second. The following examples show the usage. If you liked this article and would like to download code used in this post, please subscribe to our newsletter. You will also receive a free Computer Vision Resource guide. In our newsletter we share OpenCV tutorials and examples written in C++/Python, and Computer Vision and Machine Learning algorithms and news. As far as I remember, you have to wait for 1000/fps milliseconds in waitkey. Waiting for 1 millisecond will give you flash-fast speed. P.S., lets say video is playing at 30fps. Dont use wait of 1000/30 milliseconds, as this will be rounded from 33.3 to 30 milliseconds. The 0.3 millisecond rounded off from a long video can change the videolength. Trick like keeping a counter which when is incremented for each frame from 0. When it reaches 3, wait for 34 ms and set counter to 0. I tried to use this code to get the fps of my camera. I am getting 0.0 as my output. If you read the article carefully, it says CV_CAP_PROP_FPS does not work for webcams and that is why we have provided another method for finding the FPS. In OpenCV 3.2, CV_CAP_PROP_FPS works for webcams as well. I want to capture frames from Ps3 eye camera at 120 fps. But I am unable to capture using set capture property in opencv. Just a heads-up, in OpenCV 3.2, cv2.CAP_PROP_FPS works for all types of devices now: files, webcams, even network stream URL’s. That’s nice. I did not know that. Thanks. Hi! How can I set fps, width of frame and height of frame in my ipcamera using Opencv, because as you can see videoCapture.set() didn`t work. I have also tryed setting this using ONVIF Device Manager and still doesn`t work. Any idea? this is the best page ever!!!!! I am getting following error C++ example. Any idea why?. I checked my input .mp4 file is present in the path i specified. How to reduce frame rate of usb camera for opencv in cpp? it seem Ok. But WebCam still works on its original fps rate (30 in my case). How can I change fps rate of my WebCAM?